The overwhelming presence of computer systems in our lives today has today reached a scenario where any breach of their security can seriously affect our privacy and even financial health. Most of the times, our personal computers become the storehouse of all our personal and professional documents and files, some of which are private enough that we do not wish anyone else to access them. There can be a situation that a family member wishes to use your system for a while and you doubt whether your private stuff would not be pried into; and you cannot possible keep hovering around to keep a check. Lock Folder XP 3.7.8.1 can come to our aid in such circumstances as it helps the user to lock certain specific files with a password. Lock Folder XP opens with a neatly organized interface with the main controls placed at the top that comprise of locking and protecting tools for desired files, folders and even drives with a personalized password. The user can drag and drop specified files into the locked folder facility while it is enabled. The data protected and secured is duly hidden and cannot be accessed by anyone else and can prove to be most productive within a professional organization where security breaches and data theft is most probable. The locked files and folders are made invisible and thus cannot be deleted or damaged by anyone else, which is most beneficial in case of virus infection or hacking attempts and prevents any harm. 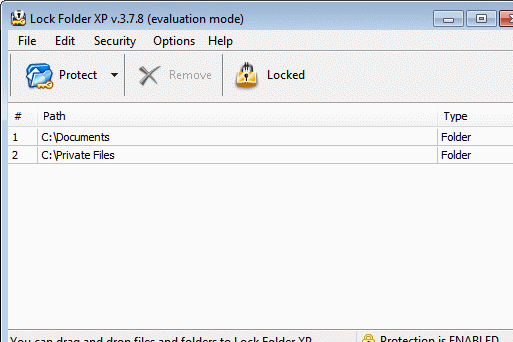 To conclude, Lock Folder XP 3.7.8.1 comes across as a suitable and efficient tool for computer users who wish to maintain privacy and thus earns a rating of three points for its impressive working. absolutely useless programme, just try booting in safe mode and there is your "locked" folder!! !